As covered elsewhere on this blog, OxyContin is an extremely dangerous drug when abused - 11 people die a day in Florida from prescription drug overdoses - hence the existence of an OxyContin Test. The producers of Oxy (as it is sometimes called), Purdue Pharma, have to their credit taken note, and come out with a new version of the pill. But with no guarantee that it cannot be manipulated for abuse, it means days without an OxyContin Test are not behind us. As reported by the AP (click to read on SFgate.com), the improvement to the drug is a new plastic coating, designed to make it harder to inject or snort. The Food and Drug Administration is skeptical but sees that there could be some advantage. At this point, with prescription drug abuse the primary culprit behind drug overdoses nationwide, something has to be done (please note: the OxyContin Drug Test is FDA Approved). The FDA has abandoned public service advisories and is now pressuring companies to come out with safer products. This is a certainly a good development, but it remains to be seen how it will affect the patterns of OxyContin abuse, and if it actually comes out, as it has not yet been approved. Perhaps it will be most helpful for kids, as teenagers in particular are experimenting with prescription drugs. Reuters has even reported that OxyContin may be more addictive for teens than adults. The increased popularity of the drug and its harmful effects is one of the reason parents OxyContin Test their children. It is a shame that a drug designed to help people with pain has had such disastrous effects on people's lives. 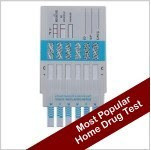 The reason there is a home drug test for Oxycontin is that the medication is indeed a drug, and a dangerous one. It is not to be taken lightly. If you think that an OxyContin Test could be helpful for you or a loved one, you can purchase one at Home Health Testing.